I’ve been on the US East Coast for awhile, to scatter my recently deceased father’s ashes with my two sisters. 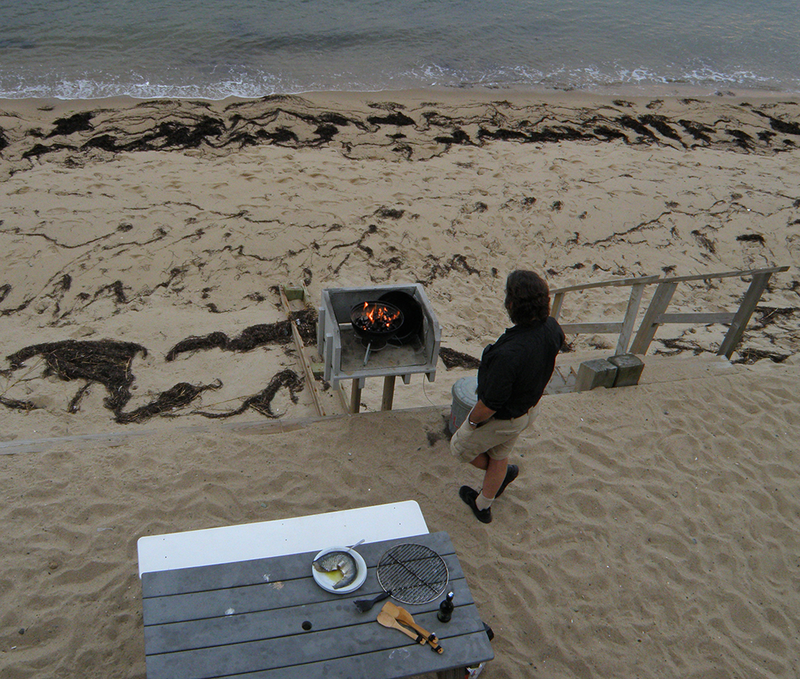 We chose a beach in Provincetown, MA that my parents enjoyed, and where we scattered Mom’s ashes a few years back. Being on Cape Cod, I’ve wanted to enjoy the seafoods that we don’t have on the West Coast. Of course, there’s lobster, which is too difficult for a transient like myself to prepare, and the smell would linger, since my room doesn’t have a fan. 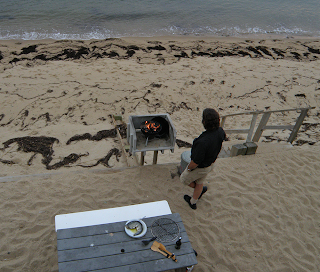 But there’s also bluefish, which my husband can grill fairly easily. This is an oily fish so can smell quite a bit, so outdoor cooking is preferable. 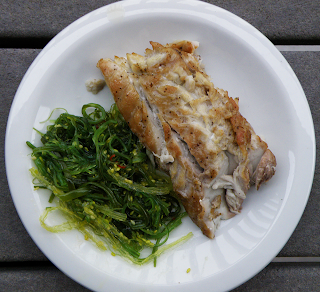 Bruce prepared the bluefish without extra spicing, so we could fully appreciate the bluefish flavor. Also we didn’t have any spicing on hand, except a lemon. He barbequed over a charcoal fire in a small Weber. It’s best to use a chimney with paper in the bottom to start the charcoal, but “Matchlight” charcoal can be tolerable as long as you allow all the lighter fluid to burn off. Avoid it if you can. Bluefish is an open water species found throughout the world, except on the US West Coasts. On the Cape, it’s here when the ocean temperature is above about 50 degrees F. It shows up sometime in early summer, and according to our local fishmonger at Cape Tip Seafoods it will be headed south soon. Allow least ½ lb. (fillet with skin) per person. That’s about one fillet per two people. Although we didn’t think to do this, I recommend cutting the fillet in half crosswise into head (thicker) and tail (thinner) sections. The thinner piece will cook faster and can be removed from heat before the thicker one. According the New England Aquarium in Boston, bluefish was overfished in the past, but current management practices and catch limits are allowing populations to rebuild rapidly. Because of the small size of gillnets used for this species, there is little bycatch—trapping of other species—associated with bluefish-ing. Bluefish are also caught by hook and line, and I understand that they put up quite a fight and are “all teeth.” More than one sports-fisherman has been bitten by a bluefish that they’ve landed into the boat. If fish is thicker on one end than the other, cut in half crosswise, separating head and tail ends. Thinner piece will cook a little faster. 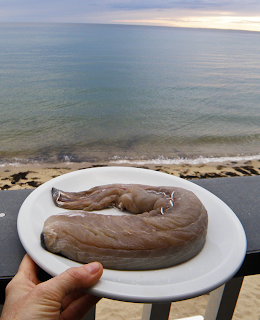 Salt and both sides of the bluefish and let it sit for up to 1 hour. Prepare BBQ: Fill bottom of chimney with crumpled paper and fill up top of chimney with charcoal. Light paper underneath. When coals are coated with grey ash, about 15 min, dump into uniform layer in Weber. Put grill on to heat, put lid on and keep vents open till grill gets hot, about 5 minutes. If you can hold your hand 3” above the grill for 3 seconds without having to move it, the grill is hot. 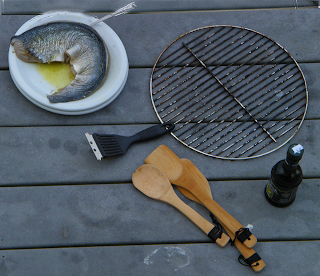 When grill is hot, put fish on skin side up. You don’t want to put skin side down first because skin can leave scales on the grill, and you want to avoid getting that into the meat. Also, if necessary, you can cook the skin side a little extra if the inside is not cooked, even charring the skin since it is not eaten, and the meat will be cooked and not burned. Grill about 6 minutes. Flip fish onto skin side. After about 6 – 7 minutes, check thickest place and see if it flakes. If it doesn’t, or if it’s pink/uncooked inside, grill another 1 or 2 minutes. Remove fish from grill and serve immediately with lemon wedges and extra salt and pepper. If you’re at home and so inclined you can also make a more elaborate sauce.